Which trim level of the 2019 Jeep Cherokee is right for me? Refreshed for the 2019 model year, the Cherokee is capable and stylish ready to hit the highway for your morning commute and the trails for a weekend get-a-way! In the 2019 model year, there are five outstanding trim levels to choose from, each delivering a slew of great features and capabilities. We are going over what each trim comes equipped with so you can find the one that is right for your lifestyle so keep reading! Latitude: The trim lineup begins with the base Latitude trim level. It comes outfitted with standard features like a six-speaker sound system, Bluetooth connectivity, a folding front passenger seats, rear seats with 60/40 split folding, Apple CarPlay and Android Auto, automatic xenon headlights, a 7-inch touchscreen interface, one USB port, a rearview camera, height-adjustable front seats, and heated exterior side mirrors. Latitude Plus: Step up to the Latitude Plus trim for all the features from the Latitude trim as well as two additional USB ports, satellite radio, cloth upholstery with leather inserts, keyless entry and ignition, a leather-wrapped shift knob and steering wheel, and a power-adjustable driver's seat. This trim can be enhanced with the available Comfort and Convenience package which adds dual-zone climate control so everyone can be comfortable, a power liftgate, remote engine start, auto-dimming rearview mirror, and a universal garage door opener. Limited: Up next is the Limited trim level. This model comes equipped with all the features from the Comfort and Convenience features as well as rear parking sensors, an 8.4-inch touchscreen interface, heated front seats, leather upholstery, a heated steering wheel, 18-inch wheels, and an upgraded driver information display. Trailhawk: Next is the Trailhawk trim which takes the Cherokee off-roading with features like all-terrain tires wrapped around 17-inch wheels, unique leather and cloth upholstery, hill ascent and descent control, unique exterior trim elements, tow hooks, off-roading oriented suspension, increased ground clearance, a locking rear differential, and an advanced all-wheel-drive system. A Trailhawk exclusive Comfort and Convenience package is available which adds features like a power liftgate, auto-dimming rearview mirror, and remote engine start. Overland: The Overland trim stands at the top of the lineup with features like cornering lights, a leather-wrapped instrument panel, a power-adjustable passenger seat, sound-deadening windshield and front windows, a nine-speaker audio system, navigation system, ventilated front seats, sliding rear seat for extra comfort, driver-seat memory functions, wood steering wheel inserts, and HD radio. 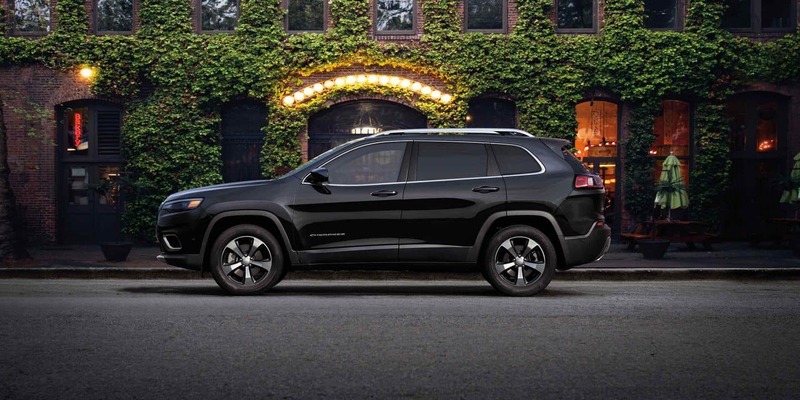 A Technology group package is available for the Limited, Trailhawk and Overland trim levels. It adds advanced safety technology like a parallel and perpendicular parking assistance system, automatic high beams, automatic wipers, forward collision warning with automatic emergency braking, lane departure warning, and traffic-adaptive cruise control. The 2019 Jeep Cherokee trim levels are incredibly well-equipped ready to take on whatever you can throw at it! You can learn even more about the Cherokee by checking out the trims we have in stock in our online inventory. Head down to the dealership to check them out in person and chat with one of our sales associates!